A new electronic toll system on the Tamar Bridge is being used by one in four drivers during the week. The TamarTag, which also operates on the Torpoint Ferry, was introduced at the beginning of the year. The pre-paid tags are attached to vehicle windscreens and automatically register when a driver uses it crossing between Devon and Cornwall. Figures from the Tamar Bridge and Torpoint Ferry Joint Committee show 25% of weekday bridge crossings are tagged. The operator said this rises to 37% during the morning rush hour. 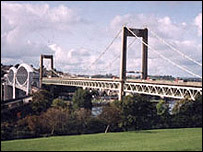 The bridge is used by about 50,000 motorists a day.